If you are a regular reader of this blog, you probably don’t need to be convinced that the movies are important. That’s the idea underlying all of our discussions here: that films and other forms of pop culture play a vital role in our society by both reflecting and affecting political, cultural, and social change. But I know many people out there who remain unconvinced that the movies – a commercial product – deserve such intense scrutiny. I understand their skepticism, especially when I ascribe serious political intent to a movie about a teenage girl trying to get laid. But beyond such subjective inquiries, the influence of some movies on our collective consciousness should not be underestimated, especially because every once in a while, one comes along that changes the way we think about a subject for years to come. Nothing in any prior film – not The Blind Side nor The Help nor Fruitvale Station nor The Butler – could prepare you for the long whipping scenes (yes, there are several) or the unbroken, static shot of a slave, hanged just low enough for his toes to touch the muddy ground, on which he is forced to continuously re-align his feet to avoid strangulation. 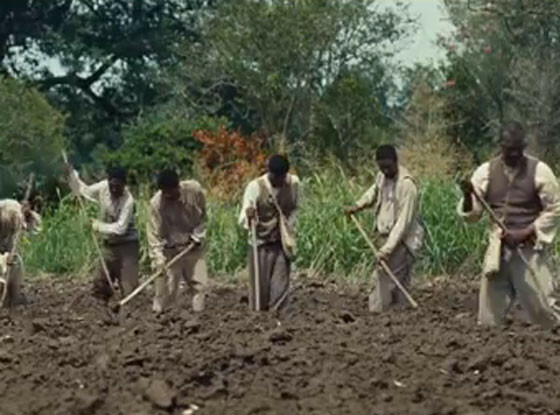 In this shot, his fellow slaves meander in the background, going about their work, having learned not to intervene. Here, the public nature of the hanging is essential – the slaveowners are sending a message about what happens to slaves who rise up – but McQueen is making us bear witness for a different reason altogether. Since the intent of 12 Years a Slave is to educate, it should not really come as a surprise that the National School Boards Association has announced it is building an entire curriculum around the film. But it should still be celebrated. For years to come, high school students will have the opportunity to “stare the stark realities of slavery in the eye through books and film,” in the words of an NSBA spokesperson. I couldn’t have put it better myself. Reading about slavery in textbooks and primary sources is important because it engages your imagination and sense of empathy, but your imagination can also shield you from pain. This is where a film like 12 Years a Slave, which uses a visual narrative to confront viewers with the realities of slavery, plays a unique and important role. Its inclusion in the national high school curriculum will benefit all students, and it’s a great accolade for a film that is likely to earn a few more this weekend. It’s also a validation of commercial filmmaking as an important contributor to society. I am sick of the need to keep opening old wounds. No doubt that it is tragic in every sense of the world, but where are the movies depicting a slow but real integration of our collective spirits. This comes off as brutality sells and not much else. I am for moving forward. I am in the midst of helping and I will reveal later my efforts. But proactive attempts to move forward. Filipino people were slaves until we emancipated the country and they were slaves for around 340 years. My point is they are moving on and trying to assimilate. Maybe racists do not want this but those of us who hate bigotry and active intolerance will be defeated. But not 10 years. No offense but this film does not feed one starving child.